Enjoy the summer warmth at Treasure Lake's pools and beaches. Don’t let the singular name fool you; there are two large lakes (and several other bodies of water) within the grounds of Treasure Lake. Each is unique. Treasure Lake is our largest body of water (379 acres), designated for motor boats (speed limit 35 mph). This makes it popular for water skiing and tubing as well as fishing and kayaking. Four beaches are maintained here as well, and it has a fully stocked marina with 200 boat rental slips. There are four boat launches at Treasure Lake. Bimini Lake (277 acres) is designated for motor-less boats as well as boats with motors of 9.9 horsepower or less, making it ideal for tranquil boating, fishing, kayaking and swimming. There is one sandy beach and one boat launch located at Bimini Lake. Little Flipper Lake is a small body of water that is managed primarily as a fishing pond for seniors and children only. It is the site that is utilized for our Junior Ranger programs for children as well. Boating is not permitted at this location. We’ve got great places to spend the day outdoors if you are not on the golf courses. The grounds of Treasure Lake contain several beach areas! Treasure Lake has no less than five areas designated for beach use. New Providence and Trinidad beaches are maintained as sand beaches intended for swimming and sunning with lifeguard watch. Bimini Lake has only one beach, and it too is maintain for swimming. Treasure Lake swimming beaches are open and staffed from noon until 5:00 p.m. (weather permitting) from Memorial Day weekend through Labor Day. MEMBERSHIP CARD IS REQUIRED AT ALL TIMES FOR EACH FAMILY MEMBER. CHILDREN 11 AND UNDER MUST BE ACCOMPANIED BY AN ADULT. GUESTS MUST HAVE A SWIM PASS AT A COST OF $3.00 FOR A DAY PASS, $10.00 PER WEEK OR $40.00 PER MONTH PER PERSON. NO PETS ARE ALLOWED IN THE SAND OR MULCHED AREAS. NO SWIMMING OUT SIDE THE ROPE. DISORDERLY CONDUCT CAN RESULT IN DISMISSAL FROM THE BEACH, AS WELL AS LOSS OF BEACH PRIVILEGES. BEACHES ARE STAFFED BY LIFEGUARDS ONLY DURING POSTED HOURS. ** Parents please watch out for the TOO’s “Too tired, Too cold and Too much sun. The Treasure Lake Marina Store is located on Treasure Lake, adjacent to the boat docks and across the dam from the Lakeview Lodge. The store offers a variety of boating and fishing supplies, as well as Pennsylvania State fishing licenses, bait, ice, soft drinks, gas, snacks, ice cream, and non-motorized boat rentals. We carry numerous souvenir items including T-shirts, sweatshirts, jackets, travel mugs, note cards, magnets, license plates, and postcards. We also have a large deck with picnic tables overlooking the water for relaxing and picnicking. We host several events throughout the season here at the Marina. Our friendly staff is waiting to serve you, so stop in and say hi. Please note that all boats utilized on the waters of Treasure and Bimini Lakes must be registered through the State of PA or another applicable state, and also the Treasure Lake Property Owners Association. Only boats owned by property owners or renters with a minimum 6 month lease may register boats. All boat decals can be purchased at the TLPOA Office. 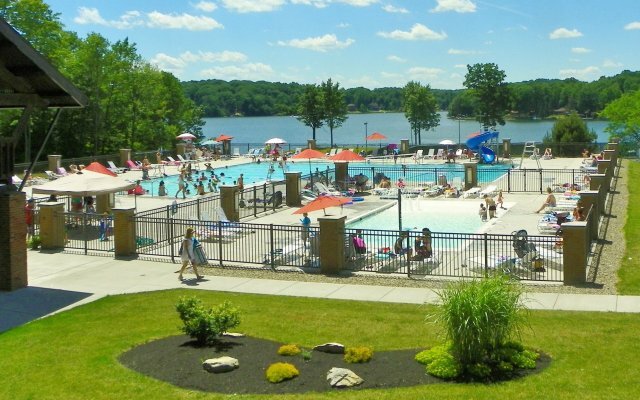 Treasure Lake has two pools located at the Lakeview Lodge and the DuBois/Treasure Lake KOA Lodge. Pools and other Treasure Lake recreational facilities are available to Treasure Lake members in good standing and their guests. The pools are open and staffed seven days a week from 11:00 a.m. until 7:00 p.m. (weather permitting) from Memorial Day weekend through Labor Day. ALL GUESTS MUST BE ACCOMPANIED BY A PROPERTY OWNER. GUESTS MUST PAY A FEE AND RECEIVE A SWIM PASS TO ENTER THE POOL AT A COST OF $3.00 PER PERSON PER DAY AT LAKEVIEW POOL ONLY. POOLS ARE STAFFED BY LIFEGUARDS AND ONLY OPEN DURING POSTED HOURS. NO ANIMALS OR PETS WILL BE PERMITTED IN THE POOL AREA. KIDDIE POOL IS RESTRICTED FOR CHILDREN AGES EIGHT AND UNDER. CHILDREN NOT POTTY TRAINED MUST WEAR SWIM DIAPERS. FLOATATION DEVICES ARE NOT ALLOWED IN THE DEEP END. TO UTILIZE THE SLIDE YOU MUST BE ABLE TO SWIM IN THE DEEP END WITHOUT THE AID OF PARENT OR FLOATATION DEVICES. YOU MUST BE AT LEAST 18 YEARS OR OLDER TO UTILIZE THE HOT TUB. GLASS CONTAINERS ARE NOT PERMITTED AT THE POOL SIDE BAR OR IN THE POOL AREA. NO OUTSIDE COOLERS OR FOOD IS PERMITTED IN THE POOL AREA. The varied waters within the Treasure Lake grounds offer excellent fishing for a variety of species, including largemouth bass and smallmouth bass, northern pike, yellow perch, crappie, a variety of sunfish, and catfish. A Pennsylvania fishing license is required. These can be purchased at the Treasure Lake Marina. For your safety, there is no fishing in the Marina area at Treasure Lake, including the boat docks. For children of age 12 years and under and seniors of the age of 62 and over, the smaller waters of Little Flipper Lake are a great place to fish. Nature trails and picnic tables are available for all to enjoy, as well as the Little Flipper Pavilion. Little Flipper Lake is also the location where most of our Junior Ranger programs are held for children.